NATO’s International Security Assistance Force (ISAF) has released its monthly data trends report for August. ISAF’s data show that while the number of enemy-initiated attacks (EIAs) thus far this year has decreased slightly, as compared to the first eight months of 2011, the number of civilian casualties increased dramatically. And the overall level of violence in Afghanistan, as measured by ISAF, remains worse than prior to the 2010 surge of American forces. ISAF releases data on the insurgency, highlighting year-over-year comparisons to show progress, each month. The first slide in ISAF’s presentation is a bar chart showing the number of enemy-initiated attacks by month from January 2008 through August 2012. The slide is included here. ISAF’s data show that the number of EIAs decreased by 5 percent during the first eight months of 2012 when compared to the same period in 2011. In addition, the number of EIAs in August 2012 was 9 percent lower than August 2011, and 33 percent lower than August 2010. The data show, therefore, that the Coalition’s enemies are executing fewer attacks than in comparable months in past years. However, the number of EIAs still remains greater than 2009, the last year prior to the American-led surge. And the number of civilians killed by insurgents in August 2012 was greater than any month since September 2009. 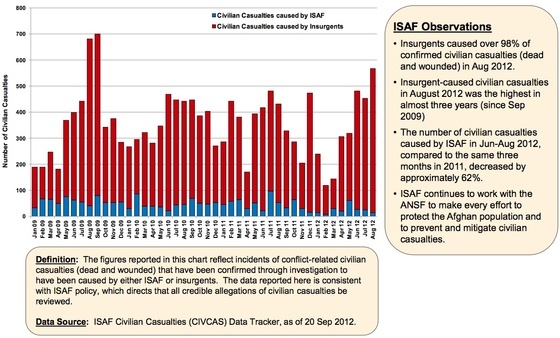 ISAF’s chart showing civilian casualties is shown here. 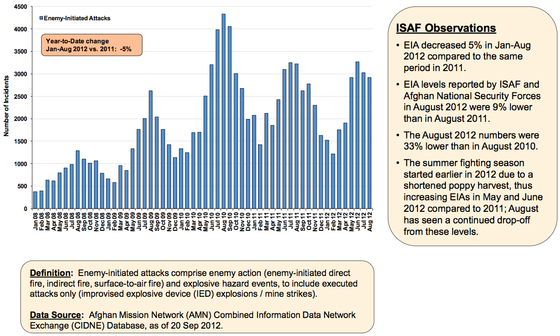 ISAF does not release the precise figures used to create its charts. The data remain classified. But ISAF’s chart on civilian casualties illustrates that the Taliban-led insurgency has killed more civilians in recent months than in comparable months from 2010 and 2011. And the increase in insurgency-caused civilian casualties has come at a time when the Coalition has greatly reduced the number of civilians killed by its actions. ISAF’s data do not directly measure the ability of the Taliban and allied groups to win and hold territory in Afghanistan. The surge, which has come to an end, made unmistakeable progress in southern Afghanistan, where the Taliban had long maintained strongholds. However, a comparable surge was not executed in the east and elsewhere, where the Taliban, al Qaeda, and allied groups maintain safe havens. For a complete analysis of ISAF’s data and other data sources, see LWJ report, Analysis: The Taliban’s ‘momentum’ has not been broken.